Membranes at the Linde engineered helium purification facility in Mankota, Canada (Source: The Linde Group). Evonik’s polymer-based membrane technology will be used in the Linde Engineering Division’s gas separation and purification plants. As a result, Linde completes its portfolio, bringing together all relevant gas separation processes within one company. Evonik’s SEPURAN® membranes enable gases such as methane, nitrogen, helium, and hydrogen to be efficiently isolated in pure form from gas mixtures. Evonik recently held a groundbreaking ceremony for the expansion of its site in Schörfling, Austria where the company is building another operations complex for the production of its SEPURAN gas separation membrane modules. The collaboration between Evonik and Linde has already resulted in a reference plant for helium purification in Mankota, Canada, which started up in August 2016. 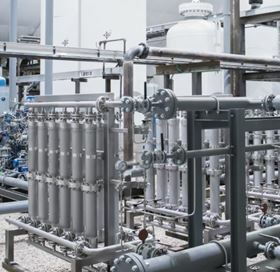 This first-of-its-kind helium purification facility uses a hybrid process of membrane and Pressure Swing Adsorption (PSA) technology. The new plant processes 250 000 cubic metres of crude gas every day, producing industrial-quality helium of 99.999% purity. The Linde Group and Evonik Industries enter into an exclusive cooperation agreement on membranes for natural gas processing.